The death of Princess Diana, Princess of Wales, sent shockwaves around the world. A nation was left in mourning, but soon feelings of suspicion surfaced: was her death all that the Establishment might wish us to believe? Now, after an exhaustive two-year probe, investigative writer and former journalist Noel Botham has dared to reveal what the people of Britain have always believed – that Diana’s death was murder. 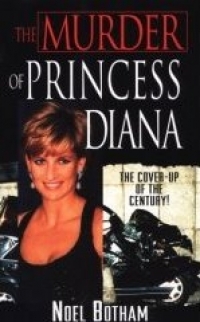 Using his unique contacts in the secretive worlds of intelligence and royalty, the author has uncovered the facts that prove Diana was – as she herself predicted she would be – the victim of a professional hit squad. He presents a clear account of what really happened on that fateful day of 31 August 1997. Why was the killing sanctioned? How was it executed? Was there really another car in the tunnel at the time of the crash? All of these questions and more, including how the truth was covered up by an official whitewash, are answered. This astounding book is what all enquiring minds have been waiting for, blowing the lid off the secrets the Establishment does not want us to know. “The Murder of Princess Diana” firmly lays to rest the theory that Diana’s death was a tragic accident, and finally gives the people of Britain the explanation they deserve.